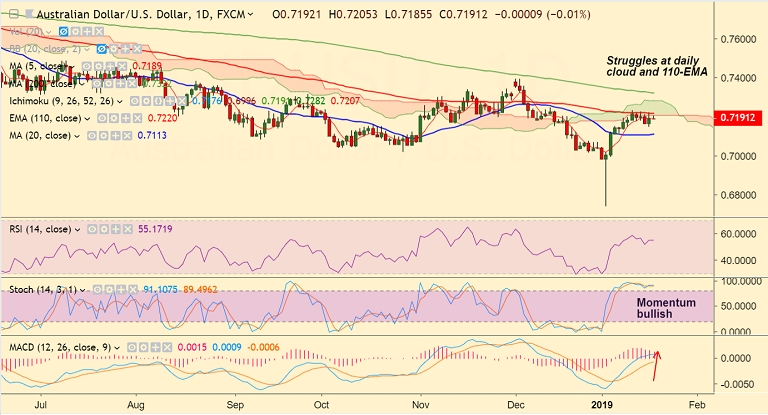 AUD/USD is trading in a narrow range, with day's high at 0.7205 and low at 0.7185. The pair is extending sideways grind, major trend remains bearish. 110-EMA at 0.7220 and daily cloud offer stiff resistance. Momentum bullish, break above 110-EMA could see some upside. Breakout above 200-DMA required for bullish continuation. Rejection at 110-EMA will see resumption of weakness.